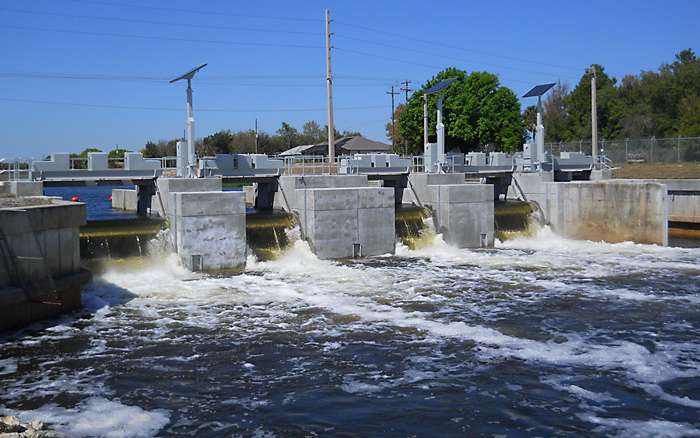 The goal of the Department of Resource Management is to ensure the sustainable use and protection of water resources for the benefit of the people of the St. Johns River Water Management District (SJRWMD) and the state of Florida. The department has six divisions: Groundwater Programs, Hydrologic Data Services (HDS), Permit Data Services (PDS), Resource Management Support and Environmental Management, Water Supply Planning, and Water Use Regulation. HDS collects, processes, manages, and disseminates hydrologic and meteorological data used for water use planning and management, environmental protection and restoration, and flood control purposes. The division operates and maintains more than 1,000 monitoring stations throughout the district. It also processes data from approximately 200 additional sites collected by county and municipal agencies through mutual agreement or by the U.S. Geological Survey under contract to the district. More than 7 million measurements are collected, verified, processed, and stored by HDS staff each year. The data is disseminated to district staff and the public upon request. HDS also compiles the district’s Hydrologic Conditions Report, posted on the district’s website each month. SJRWMD has set up a data acquisition network using Campbell Scientific equipment to monitor rainfall and water level for baseline data, water management, and flood control response and warnings. The network uses over 370 Campbell Scientific dataloggers interrogated by four base stations that retrieve data to a central Hydstra database. The district has three UHF licensed frequencies. The district headquarters in Palatka has two RF base stations. Each base station uses its own frequency— combined they poll 208 stations. There are remote base stations at Apopka (68 sites) and Palm Bay (98 sites) to poll the remaining stations. A broadcast Time Domain Multiple Access (TDMA) technique has been used by Campbell Scientific since the early 1990s for networks requiring high data throughput. The RF bandwidth is tightly controlled and optimized to move data from many dataloggers as efficiently as possible. This method allows for stand-alone repeaters, and also allows datalogger measurement sites to act as repeaters. The technology focuses on measuring, storing, and transmitting accurate time-stamped data. LoggerNet software rapidly gathers real-time data as the highest priority, but in inactive periods collects any outstanding time-stamped historical data allowing any “holes” in the data to be filled. Additionally, maintenance functions such as new program download, operating system download to the datalogger, clock synchronization, and changes to settings are performed during inactive periods. The data is transferred in a master/slave configuration. At each poll interval, the RF base station (master radio) broadcasts a message to all dataloggers (slaves) that can be reached without using a repeater. Upon receiving the broadcast, each datalogger sends its data at the pre-defined time; time windows can be less than one second. When sites are accessed through a repeater, the repeater sends out a broadcast to its remotes that in turn respond with their data at pre-defined times. The data is placed in packets and sent to the server at the RF base station. There can be any number of repeaters; sites at St Johns are up to four deep in the network. SJRWMD was pleased with the network performance during the summer hurricane season of 2004. The RF system worked flawlessly. There were problems with the intranet provider, causing links to the two remote LoggerNet–RF base stations to be lost. A redundancy has been designed into 16 of the most critical sites using CR510s and digital cell phones to provide redundant access to the data. The original contract required Campbell Scientific to install the first 20 sites and prove the technology. After training, the district installed the remainder of the sites. One hundred additional RF telemetry sites are planned for 2006.